When Isabel Williams first joins Class 2F of St Leonards School, she seems so tiny and insignificant, that no one takes much notice of her. The only person to make immediate friends with her is Robert Morgan who invites her home for lunch. But when the class has a science lesson, in which they are asked to design different types of bridge, she amazes everyone by contradicting Mr Phillips the teacher. Is draws an arch bridge – a longer, flatter arch than Mr Philips will accept is practicable. A conflict is inevitable as her whole manner seems to change. No longer the timid schoolgirl, she acts and sounds like an adult, daring to argue with him and insisting that she knows more than he does. That is only the start of an increasingly bitter conflict between her and her teacher. Yet a few days later when Robert finds proof that her ideas were true, (such a bridge exists at Maidenhead) and Mr Phillips was totally wrong, she doesn’t seem interested. Robert tries to help Isabel, yet at the same time he is confused by her attitude and even more confused by the extraordinary revelation she makes to him during a trip to Wapping to view the first tunnel under the Thames. As Robert is to find out, Isabel Williams is not who she seems to be. She believes herself to be none other than Isambard Kingdom Brunel. After this revelation she demonstrates extraordinary knowledge of engineering and, with increasing passion, assumes the personality of Brunel. Robert becomes more and more irritated by her behaviour, not knowing what to believe. At the same time, he discovers that aspects of her home life aren’t true. The friction between her and her teachers culminates in a violent argument about Brunel’s final massive project - the Great Eastern - and Is disappears. 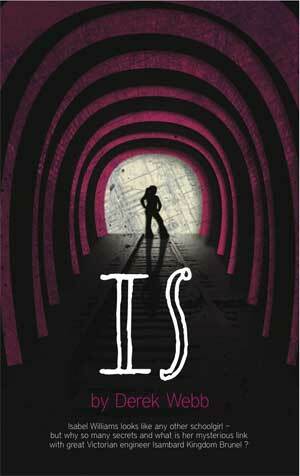 Special Offer: order a personally signed copy of 'Is' for £6.99 inc. p&p! Order a copy of 'Is' now and have it personally signed by the author and sent to you post and packing free, for just £6.99! Simply write what you would like as a dedication in the box below and buy using PayPal or credit card. For example: "To (your name), Best wishes Derek Webb"
'Is' by Derek Webb is published by Troll Carnival and available from your local bookshop as well as from Amazon Waterstones or Gwales It will shortly be available as an e-book too!